Today Oppo announced the R11 Plus alongside the smaller R11 and we were there to watch it unfold and, as it happens, snap a ton of photos of the two devices. We wanted to share those photos with you guys so that you can get an idea of what the two new metal-clad phones look like. The Oppo R11 Plus is the bigger of the two though it has the exact same design as the R11. It packs a 6" 1080p AMOLED and a bigger 4,000mAh battery. Both carry a dual camera setup on the back that consists of a 16MP normal camera sitting behind a bright f/1.7 lens and a 20MP telephoto (or zoom) lens with a smaller f/2.6 aperture. Despite being the smaller of the two, the Oppo R11 has a respectable 5.5" 1080p AMOLED at the healm. Outside of the aforementioned battery and screen size difference the Oppo R11 carries 4GB of RAM - less than the Plus' 6GB. Both R11 models have VOOC Flash Charge and both use the new Snapdragon 660 chipset. To give you a better idea of the size of the two phones and their size differences we lined them up next to a 4.7" iPhone 7 and a 6.2" Galaxy S8+. 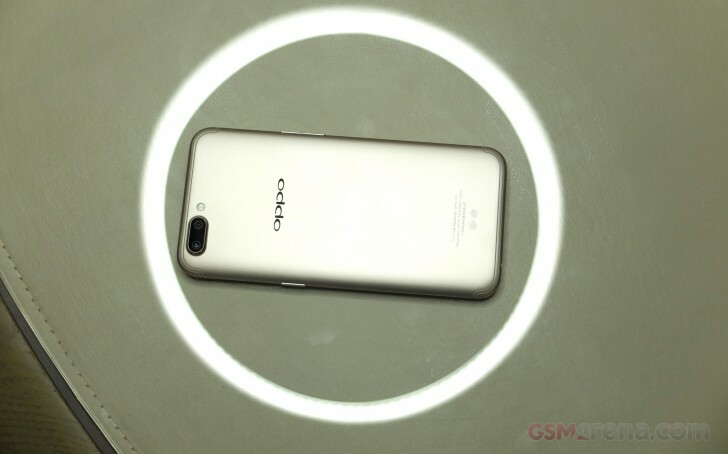 We're still waiting to find out when and where the Oppo R11 and R11 Plus will become available but at least we had a good look at the retail package the phones will ship in. You get Oppo's VOOC charger and cable plus a pair of headphones. Check back next week for the full account of our hands-on experience with the Oppo R11 and R11 Plus.